(with an unduly optimistic headline), an article on Iranian influences in the Iraqi elections written for BBC Persian with English original available here, and a piece on US policy issues in the Iraqi election written for the Middle East Institute. For further articles and continuing coverage of the results of the 2014 Iraq parliament elections, visit my WordPress blog. 31 May 2012: Is Maliki About to Fall? Feature on the attempts to bring a no confidence vote against the Iraqi prime minister. With comments to AFP about the P5 plus 1 meeting on the Iranian nuclear file in Baghdad and quotes by The New York Times on the question of the influence of Ayatollah Shahrudi in Najaf and the Sistani succession and by The Financial Times on Maliki's survival strategies. 26 March 2012: The Baghdad Gamble: Maliki Brings the Arab League to Town. Comment article published at the Foreign Affairs website (discussion section here). With comments to The Washington Post on the Arab League summit and Iraq-Saudi relations as well as on Sunni federalism in Iraq. Also AL summit comments to AFP. 20 February 2012: The New Political Balance of the Iraqi Parliament. With comments on the struggle between Iraqiyya and Prime Minister Nuri al-Maliki to Reuters and AFP, and to AP about the Hashemi case. 16 December 2011: Thoughts, More Than Actions, Shaped the Iraq War Legacy: Op-ed on the end of the Iraq War published in The New York Times. With a discussion forum here and comments to Reuters about post-withdrawal politics in Iraq. Additional comments to The New York Times about the breakdown of politics subsequent to the exit of the last remaining US forces, and quotations in The Globe and Mail, The Star (Toronto) and by McClatchy. 30 November 2011: Finally, Some Good Sunni Federalism: Are You Happy Now, Joe? On the latest visit to Iraq by Vice President Joe Biden. With quotation in Der Standard (Vienna) and comments to AFP on the de-Baathification process and the link to the federalism question. Quoted by Patrick Cockburn writing in The Independent. 30 October 2011: Christopher Hill and the Iraq War Legacy. With quotations in The Washington Post and The Daily Star (Beirut) on Sunni federalism. 28 September 2011: Iranian Influence in Iraq: “Religious Allegiances among Pro-Iranian Special Groups in Iraq”, published in the Combating Terrorism Center Sentinel (New York: West Point), with a companion article, "Washington Heads Buried in Middle Eastern Sand". Also comments to AFP on the US withdrawal from Iraq and the question of Iranian influence. 25 August 2011: Realistic Policy Options in Iraq: "Of Instructors and Interests in Iraq" published at MERIP Online, and "Power Grabs and Politics Are Stalling Progress in Iraq", op-ed published in The National (Abu Dhabi). With a related comments/discussion forum here. 30 July 2011: The Iraqi Government Gets Downsized: Political and Constitutional Considerations. With comments to AFP on the question of the US withdrawal. 30 June 2011: How to Shrink the Iraqi Government, Consolidate the Cabinet and Make an Informed Decision about the US Military Presence. Op-ed published in The National (Abu Dhabi). With related commentary in the Arab Reform Bulletin (Beirut), and media comments to the CSM. 31 May 2011: A Presidency in Disarray: Abd al-Mahdi Resigns Three Weeks after Being Appointed as Deputy. With comments to AFP and Al-Jazeera about Maliki's first 100 days. 13 February 2011: The Ongoing Government-Formation Process in Iraq: Phase 2 Completed. With comments on the oil/budget issue to AFP and on the status of the independent commissions after the latest ruling by the federal supreme court to The Washington Post. Also an interview with the AFP on the one-year anniversary of the 7 March 2010 elections and comments to The New York Times on how women fared in the government-formation process. 21 December 2010: Parliament Approves the Second Maliki Government. With media comments in The New York Times, Washington Post, Washington Times and McClatchy. 30 November 2010: Now available from Amazon: A Responsible End? The United States and the Iraqi Transition, 2005–2010. The best blog posts from historiae.org and gulfanalysis.wordpress.com in a handy 302-page format, edited with a Preface and 11 chapter introductions. To go directly to Amazon click here. With a companion article at the Foreign Affairs website and a guest column at Informed Comment. 11 November 2010: Nujayfi, Talabani and Maliki – Plus Lots of Hot Air. With comments to The Washington Times and Reuters. 1 October 2010: 208 Days and Counting: Iraq Beats the World Record in Slow Government Formation. With a postscript on the nomination of Nuri al-Maliki as the premier candidate of the all-Shiite National Alliance (NA), and comments on developments to Reuters and The New York Times. 26 August 2010: Armistice and Governance in the Iraqi Government-Formation Process: The US Position. With comments to Reuters on the latest developments in the government-formation saga, and to The News Journal about US policy options. Also quotation in CSM about the potential role of the Sadrists in the next Iraqi government and comments to The New York Times regarding US policy options. 14 June 2010: The Iraqi Parliament Opens, and Stays Open. With comments to Bloomberg on the prolonged first session of parliament, and an interview with the Council on Foreign Relations website on the state of coalition-forming talks. 3 May 2010: The Mathematical Parameters of the Baghdad Recount – Can the Result Really Change? With comments to The New York Times and The Economist. Also quotations in The New York Times on the subject of post-election de-Baathification. 26 March 2010: The Uncertified Election Results: Allawi Comes Out on Top. With comments on the Baghdad recount to Bloomberg and on the coalition-forming process to CSM. 14 March 2010: Partial Election Results for 13 Governorates Released by IHEC. Updated on 15 March with figures for all governorates south of Kurdistan. With comments to The Wall Street Journal on the Sadrist comeback, and to Reuters about the Allawi/Maliki struggle. 18 February 2010: Three’s a Crowd. Iraq’s political system is about to change in a dramatic way, but few seem to take notice. Published in The National (Abu Dhabi). With comments to Reuters about the upcoming elections, in separate stories here and here, and about de-Baathification to NPR and Foreign Policy. Further commentary on the 7 March elections: Foreign Affairs, Radio Free Europe/Radio Liberty, Bloomberg, AFP, The Nation/Middle East Online and Reuters. 27 January 2010: Decentralisation Bonanza in the Iraqi Budget. Also, an opinion piece on the de-Baathification crisis published at the website of Foreign Affairs, and quotation in Der Standard (Vienna) regarding the continuing dispute with Iran about al-Fakka and in The Washington Post and The New York Times on the exclusion of Salih al-Mutlak and Zafir al-Ani from the parliamentary elections..
20 January 2010: The 511 De-Baathification Cases: Sectarianism or Despotism? With comments to AFP about the visit to Baghdad by Joe Biden and a related interview at the Council on Foreign Relations website. Also quoted by Michael Jansen (Irish Times/Middle East International). 6 December 2009: No Second Veto: The Election Law is Approved by Tariq al-Hashemi and the Iraqi Presidency. With comments to Reuters on the Iranian incursion in Maysan, quotation in The National (Abu Dhabi) and by AFP on the exclusion of Salih al-Mutlak. 8 November 2009: The Election Law Is Passed: Open Lists, Kirkuk Recognised as a Governorate with “Dubious” Registers. With comments to NPR about Peter Galbraith and the Tawke-gate affair, and to Reuters about the veto of the election law by Tariq al-Hashemi. Also an interview with the Kurdish newspaper Rudaw, and comments to The New York Times about foreign oil investments in southern Iraq. 21 October 2009: The Unity of Iraq Alliance: Another Second-Generation Coalition. Quoted in The New York Review of Books and by CBS & The Nation. With comments to Reuters and The Economist about the coalition-forming process. 10 October 2009: New DNO Revelations: While He Was Influencing the Shape of the Iraqi Constitution, Peter Galbraith Held Stakes in an Oilfield in Dahuk. An investigation by a Norwegian newspaper creates a political scandal in Iraq. With comments to The Boston Globe, Radio Free Europe/Radio Liberty and quotations in Foreign Policy and the Financial Times. 1 October 2009: Maliki Re-Launches the State of Law List: Beautiful But Is It Powerful Enough? Quoted by Reuters, and with comments to Voice of America. 10 September 2009: Identity Carved, published in The National (Abu Dhabi). On how the policies of Iran and the Obama Administration converge in surprising ways in northern Iraq. With comments to the Daily Telegraph. 24 August 2009: After Sadr–Badr Compromise in Tehran, the Iraqi National Alliance (INA) Is Declared. With quotation by Bloomberg, and comments on the passing of Abd al-Aziz al-Hakim to The Wall Street Journal, The Washington Post, Financial Times, The Times and Los Angeles Times. 28 July 2009: Proportional Representation Dispute in Iraq: Parliament Adjourns without Adopting an Election Law for 2010. Quoted by Larry Kaplow writing for Newsweek. 6 July 2009: Biden, US Policy in Iraq and the Concept of Muhasasa. Quoted by Inter Press Service, UPI, Daily Analysis by the Council on Foreign Relations and The Washington Independent. 28 June 2009: The First Licensing Round Gets off the Ground: The Politics of Oil in Iraq. With comments to The National (Abu Dhabi) on the situation in Basra, and an op-ed on Norway's Iraq policy and the role of StatoilHydro (published in Norwegian in Dagens Næringsliv, 7 July 2009). 25 May 2009: Disputed Territories in Iraq: The Practical Argument against Self-Determination in Kirkuk. Quoted in the Middle East Times, and with comments to Reuters about the withdrawal of US troops from Iraqi cities on 30 June. 19 April 2009: Maliki Suffers Setbacks as Samarrai Is Confirmed as New Speaker and More Governors Are Elected South of Baghdad. The election of Ayad al-Samarrai means a defeat for Nuri al-Maliki, whereas appointments of key officials in Maysan and Wasit leave ISCI in a stronger position than many had expected. 13 April 2009: Iraq’s New Provincial Councils: A Mixed Picture North of Baghdad, Unexpected Complications in the Centre and the South. With comments to LA Times and Reuters (separate stories here and here) on the post-election situation. 19 March 2009: Post-Sectarian Strategies for Iraq. Two new reports on policy options for the United States and the international community in Iraq. With comments to Reuters about the national reconciliation process in Iraq. 27 February 2009: Obama’s New Iraq Strategy: Clarity on Troop Withdrawals; Uncertainty about Political Reform. On the lack of detail with regard to the political component of the new US policy in Iraq. 19 February 2009: The Provincial Elections: The Seat Allocation Is Official and the Coalition-Forming Process Begins. Maliki's position looks even more dominant after the distribution of seats. 5 February 2009: No Longer Supreme: After Local Elections, ISCI Becomes a 10 Per Cent Party South of Baghdad. Quoted by CNN and AFP. 30 January 3009: A Litmus Test for Iraq. The provincial elections of 31 January. Published at Middle East Report Online. With comments to AFP and Reuters on the elections, and quotation in The National (Abu Dhabi). 22 December 2008: The Candidate Lists Are Out: Basra More Fragmented, Sadrists Pursuing Several Strategies? With comments to Los Angeles Times and The New York Times/International Herald Tribune. 27 November 2008: The “Withdrawal Treaty” is Passed. With comments to Reuters about the SOFA and Maliki's rise. Also quoted in Daily Analysis by the Council on Foreign Relations. 11 November 2008: An Initiative to Create the Federal Region of Basra Is Launched. The first attempt to create a federal entity in Iraq outside Kurdistan. With an update (19 November) on Signs of Competition in the Struggle about Basra and Federalism? and comments to Reuters about developments within the Sadrist movement. 7 November 2008: The Obama Administration, Iraq, and the Question of Leverage. With comments to USA Today, Der Spiegel and Reuters about the policy of the next US administration. 3 November 2008: Iraqi Minorities Get Special Representation in the Provincial Elections Law. The new arrangements reflect the ongoing struggle over Mosul and Nineveh province. 31 October 2008: The Map of Electoral Coalitions South of Baghdad Is Taking Shape. More tension between ISCI and Daawa? 20 October 2008: The End of Soft Partition. Book review of Peter Galbraith’s Unintended Consequences: How War in Iraq Strengthened America’s Enemies, published at the History News Network. Also, some thoughts on the SOFA and the US-Iraqi strategical framework, and, on a lighter note, a contribution to (Not Quite) 101 Things Sarah Palin Should Know About the World at Foreign Policy. 3 October 2008: Biden’s 700 Years and the Dangerous Road to a “Settlement” in Iraq. How Democratic strategy could sideline the nationalist forces in Iraq and benefit regional powers like Iran. With a commentary to The Times on the British role in Basra. 1 October 2008: Five Years On: The Pentagon Still Struggling to Make Sense of Iraq. The latest report from the Pentagon to the US Congress is titled “Measuring Stability and Security in Iraq”. 27 September 2008: No, Senator Obama, On This One You Were Wrong and McCain Was Right. On last night's presidential debate. Quoted in “Candidate Mistakes Muddy the Race” in Washington Times. 24 September 2008: After Compromise on Kirkuk, Finally an Elections Law for Iraq’s Governorates. With comments to Reuters about the future of the Sadrist movement. 16 September 2008: No Friends but the Kurds? The Biden Problem in Democratic Iraq Policy. Joe Biden and other Democrats still prefer to read the Iraq situation with lenses from 2006. 23 August 2008: Change the Iraqis Can Believe In? Why Obama–Biden Could Mean More of the Same (Or Maybe Something Worse). With comments to Reuters about the relevance of the soft partition alternative, and an interview in USA Today on the viability of a long-term foreign military presence in Iraq in historical perspective. Also published at Atlantic Community. 22 July 2008: The Iraqi Parliament Passes the Provincial Elections Law. With a 7 August update on the presidential veto of the bill and the failure of the parliament to amend it, and related coverage in Daily Analysis by the Council on Foreign Relations. 3 July 2008: The Sadrists, the Bush Administration Narrative on Iraq, and the Maysan Operations. Developments in Maysan province underline the futility of an Iraq narrative that construes the Sadrists as one hundred per cent "pro-Iranian" radicals and the Maliki government and ISCI as "Iraqi nationalists" and "Shiite mainstream". 16 June 2008: Iraq’s Provincial Elections: Another D-Day Approaching. On how manipulations by the Maliki government could affect the upcoming provincial elections and the entire regional balance of power. With additional comments on developments among the Sadrists and the security situation in Amara to Reuters and AFP (in French). Now available in Arabic: Basra and the Dream of a Gulf Republic: Limits of Southern Separatism and Roots of Iraqi Nationalism, 444 pages, illustrated, updated through 2007. Translated by Said al-Ghanimi and published by Manshurat al-Jamal. With a recent review in the Lebanese newspaper al-Mustaqbal. Retail price USD 12 at the Neel & Furat online bookstore. 28 May 2008: The Stockholm Conference and Conditionality in Iraq. Should Arab states unconditionally open embassies in Baghdad and cancel Iraqi debts? 15 May 2008: The Sadrists of Basra and the Far South of Iraq: The Most Unpredictable Political Force in the Gulf’s Oil-Belt Region? Background paper on internal rivalries within the Sadrist movement, and how US policy could affect Muqtada al-Sadr's strategies in the future. With related comments to CNN. The narrative that just doesn’t work: “On the other hand, if we succeed in Iraq after all that al-Qaida and Iran have invested there, it would be a historic blow to the global terrorist movement and a severe setback for Iran. It would demonstrate to a watching world that mainstream Arabs reject the ideology of al-Qaida, and mainstream Shiites reject the ideology of Iran’s radical regime.” (George Bush, 10 April 2008). “Mainstream Shiites”, yes, but apparently not Bush's own favourites, such as Abd al-Aziz al-Hakim, pictured here in a recent meeting with Iran’s Ali Khamenei. “Rejection” simply isn’t the term that comes to mind. 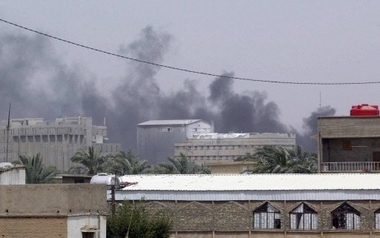 9 April 2008: Maliki, Hakim, and Iran’s Role in the Basra Fighting. Based on an article published in Terrorism Focus vol. 5 no. 14, with additional commentary on the US Congress hearings on Iraq policy. Also comments to USA Today and Reuters on the campaign against the Sadrists. Basra is burning: After having first tried to distinguish between moderate Sadrists and radical splinter cells loyal to Iran, the US and the UK have now uncritically and even enthusiastically espoused Nuri al-Maliki's apparent attempt at a more general war against Muqtada al-Sadr. This despite (some claim because of) repeated signals that the Sadrists are committed to the political process and want to contest the local elections. 10 March 2008: Debating Devolution in Iraq. Published at Middle East Report Online. As Iraq’s federalization process enters phase two, it’s centrists versus ethno-federalists. 11 February 2008: The Law on the Powers of Governorates Not Organised in a Region: Washington’s “Moderate” Allies Show Some Not-So-Moderate Tendencies. With a brief update (14 February) on the passage of the law in the Iraqi parliament, also published in an extended version (including comments on the 27 February veto by the presidential council) at The Atlantic Community. 18 January 2008: Ashura Sees Iraq’s Shiites Divided between Sectarianism, Iraqi Nationalism, and Mahdism, with a brief update on the situation in Basra and Nasiriyya published 20 January and comments to Los Angeles Times. 13 December 2007: Nonsense of Congress on Federalism in Iraq. On the adoption by the US Congress of the 2008 defence authorisation bill. Also available is a background paper relevant to the forthcoming British handover of Basra (scheduled for 16 December), with a focus on the tensions which British and US military authorities are overlooking – and which the Iraqi government want them to overlook. With comments on the security situation in the far south to Reuters, regarding Basra and Amara. 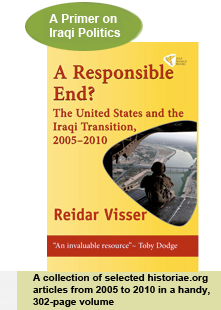 12 November 2007: Will 2008 Be the Year of Federalism in Iraq? 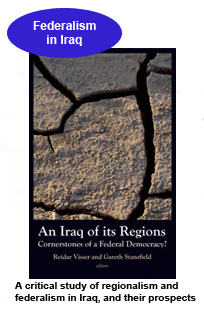 A new book, An Iraq of Its Regions, features critical perspectives on Iraq’s federalization process. With related coverage at Aswat al-Iraq, the Iraqi newswire service (in Arabic). 8 October 2007: The Planned Basra Handover; Iraqi Reactions to the US Senate Vote on Federalism. Critical perspective on the timing of the British handover plans in Basra published at The Atlantic Community, plus Iraqi reactions to the US Senate vote on federalism and what they mean to US policy: op-ed in The News Journal published in Wilmington, Delaware – the home state of Senator Joseph Biden, the principal American advocate of “soft partition” in Iraq. Also related news story on Basra in Newsday (Long Island/NYC) and on the Council on Foreign Relations website, and a letter to the editor published in The Hill (Washington, D.C.) about contradictions in Biden’s claim to have a distinctive “Iraq plan”. 27 September 2007: The US Senate Votes to Partition Iraq. Softly. Reprinted in The Arab American News (Dearborn, Michigan); related coverage in The News Journal (Wilmington, Delaware). Also two further comment articles on foreign involvement in Iraq’s national reconciliation process: a positive one involving football (originally published in Norwegian in Aftenposten, Oslo, 26 September 2007); another more negative one focused on the Norwegian oil industry (translated from an op-ed in Dagbladet, 14 June 2007). 14 September 2007: US Policy in Iraq at a Crossroads. Critical perspective on how the “surge” is working in areas south of Baghdad in Terrorism Monitor (also reprinted in a shorter version in Asia Times Online), and an op-ed on the “partition” alternative, published at the History News Network, with related coverage in the cover story of the 1 October issue of Maclean’s, the Canadian national weekly. Also comments to the Berlin-based Atlantic Community on US policy in Iraq, and the prospects of a European role. 19 August 2007: Another Bout of Partitionism. The campaign for an Iraq divided on the basis of ethnic and sectarian identities adds some academics to its ranks, but the arguments for partition remain as unconvincing as ever. Review of Edward P. Joseph and Michael E. O’Hanlon, “The Case for Soft Partition in Iraq”, and Amitai Etzioni, “Plan Z: A Community Based Security Plan for Iraq”. With related interview in The New York Times (19 August 2007), and comments in The Boston Globe (21 August 2007) and The International Herald Tribune (via AP, 22 August) on the US failure to activate Iraqi nationalist sentiment for instance by reaching out beyond the Maliki government. Additional coverage at The Huffington Post and in The Baltimore Chronicle and Sentinel. 17 July 2007: The Supreme Council Marks the Fourth Anniversary of Baqir al-Hakim’s Assassination – No Mention of Federalism. Are Shiite leaders reconsidering their position on the idea of a single Shiite federal entity? With related commentary on the Iraq partition question in The Star (Toronto) 22 July 2007, and on the situation in Basra (United Press International, 16 August 2007). 17 July 2007: The Gibraltar That Never Was. Paper presented to the British World conference, Bristol, 11–14 July 2007, originally titled “A Rigid Conception of Britishness: Imperialism, Local Regionalism and Transnational Links among the British of Basra and Abadan, 1890–1940” and published here with an epilogue on the contemporary geopolitics of the Shatt al-Arab delta and some reflections on current British and US policies. 11 June 2007: Iraq’s Constitutional Revision: Give the Iraqi Politicians an Offer They Cannot Refuse. Why the United States should encourage limits on federalism in Iraq. 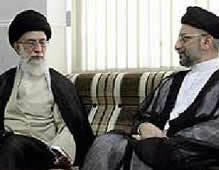 12 May 2007: SCIRI More Flexible on Federalism, but Fails to Resolve Khamenei Ambiguity. The supposed makeover of SCIRI (SIIC) raises more questions than it answers. With related coverage in al-Hayat and the Kuwaiti al-Qabas (in Arabic). 23 April 2007: Why “Gated Communities” Will Face Opposition in the Iraqi Capital. Westerners tend to overestimate the Iraqis’ desire for territorial segregation along sectarian lines. 10 April 2007: Unitary State, Federalism or Partition? Poll Data Give Mixed Picture of Iraq South of Baghdad. Also including some extraordinary survey results from Sadr City. 20 March 2007: Democratic Alternatives for Iraq. In their efforts to create an alternative Iraq discourse, the Democratic Party adopts a cavalier attitude to the country's history. 27 February 2007: Basra Crude – The Great Game of Iraq’s “Southern” Oil. Background paper of relevance to the new Iraqi oil and gas law. With an update (6 March) on the leaked final version of the draft law, and a companion article, “Basra, the Reluctant Seat of Shiastan”, published in Middle East Report no. 242, special issue on the Shiites in the Arab world, also available in a Turkish translation (PDF) from Stratejik Analiz (Ankara), June 2007. 29 January 2007: Ashura in Iraq – Enter Mahdism? With related commentary in Reuters reports of 29 January, 30 January and 2 February as well as in the Boston Globe & The International Herald Tribune (31 January). 11 January 2007: What Exactly Is Washington Surging for in Iraq? On the problems of implementing a troop surge without including a credible political component. (Also reprinted in The Arab American News, Michigan, and published at openDemocracy.) For a discussion of why the “alternative” policy proposed by Senator Joseph Biden is even more problematic – and could amount to presenting the whole Middle East to al-Qaida on a silver platter – see the historical background essay “Other People’s Maps”, published in the Wilson Quarterly (Winter 2007) by the Woodrow Wilson International Center for Scholars, Washington DC. 21 December 2006: A Strategy for Dealing with the Sadrists? A US “surge” campaign to marginalise the Sadrists has obvious weaknesses, and could prove futile unless there is serious attention to political reform. See also the comment article A Timetabled, Conditional Surge (29 December 2006) and marginal notes to the Iraq Study Group report, published at the Institute for the Future of the Book’s website as a Lapham’s Quarterly project (7 January 2007). 6 December 2006: The Iraq Study Group – Regionalisation Not Balkanisation. Dialogue with Iraq’s neighbours might increase the United States’ range of options in Iraq and help Washington extricate itself from the country. 4 December 2006: Federalism from Below in Iraq – Some Historical and Comparative Reflections. Why the emergence of a tripartite Kurdish–Sunni–Shiite federation in Iraq is actually quite unlikely from the legal and procedural point of view. Paper presented to the international workshop “Iraq after the New Government: Stabilisation, Reconstruction and the Security Regional Scenario” arranged by the Landau Network, Como, Italy, 24–25 November 2006. 20 November 2006: In Basra, Iraqi Nationalism Remains Proud and Articulate. Physically they may look monotonous, but Iraq’s southern flatlands are more complex than facile stereotypes in Western media would suggest. For more on the inadequacy of sectarian paradigms for understanding southern Iraq, see Ottoman Provincial Boundaries, Shiite Federalism, and Energy Conflict in Iraq, English version of an article which appeared in Turkish in Stratejik Analiz (Ankara), November 2006. Turkish text available here. 27 October 2006: There Is No Biden Plan. Comment article published at Just World News. US policy debate on Iraq should be purged of the spurious partition alternative. 27 September 2006: The Draft Law for the Formation of Regions – A Recipe for Permanent Instability in Iraq? The proposed text may deepen the confederal nature of the Iraqi polity by giving advantages to those in favour of a system of a few large-scale regions instead of several small ones. With an added note on the adoption of the law on 11 October 2006. 17 September 2006: Another Iraq Deadline Passes. The simmering controversy over the implementation of federalism is once more heating up. 17 August 2006: Divide and Rejoice - Why Are Western Intellectuals so Enamoured with the Idea of a Fragmented Iraq? Book review of Peter W. Galbraith’s The End of Iraq: How American Incompetence Created a War without End, published at the History News Network (Seattle, Washington). 11 July 2006: Britain in Basra – Past Experiences and Current Challenges. Paper presented to the Global Gulf conference, University of Exeter, 4–6 July 2006 and originally titled “Melting Pot of the Gulf? Cosmopolitanism and Its Limits in the Experience of Basra’s British Community, 1890–1940”; published here with some additional reflections on multi-culturalism in contemporary Basra and the current British role in the city. Later quoted in The Independent. 9 June 2006: Building Federal Subunits by Way of Referenda – Special Challenges for Iraq. International constitutional experts have fixed their eyes on Spain as a federal model for Iraq, but historical contrasts between the two countries mean that Iraq faces certain special problems not shared by Spain. 23 May 2006: The Maliki Government – What It Could Mean to Southern Iraq. Nuri al-Maliki is seeking allies in an unruly periphery. For a related news story and interview, see “Iraq's Premier Sets State of Emergency for Southern City” in The Washington Post 1 June 2006. Maliki’s singling out of a mainly Shiite governorate in this first major demonstration of power illustrates the futility of reducing complex Iraqi politics to a conflict between three ethno-religious groups. With an addendum dated 9 June 2006 on the completion of the Maliki government. 19 May 2006: Iraq and the Partition Fantasy. Comment article published at openDemocracy. On recent federal and confederal schemes for Iraq (especially the Biden & Gelb proposal), with discussion of relevant issues in the upcoming revision of the Iraqi constitution – particularly with regard to the implementation of federalism. Also available in an Arabic translation (PDF) published by al-‘Arab al-Usbu‘i (London). This version was not prepared in consultation with the author and contains some divergences from the original text. Please refer to the English text in case of any ambiguity. 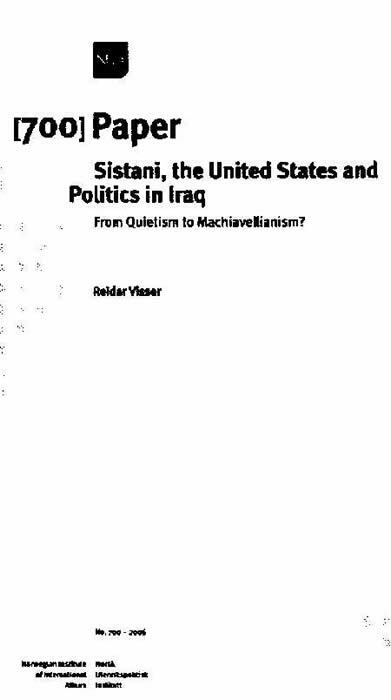 12 March 2006: Sistani, the United States and Politics in Iraq: From Quietism to Machiavellianism? With a commentary added 29 April 2006 on the latest pronouncement by Sistani regarding the formation of a new Iraqi government, and a related news story at Radio Sawa (Arabic). Is a second Iran emerging in Iraq? This study covers Sistani’s interaction with key concepts in contemporary Iraqi political debate, like democracy, federalism and the “rule of the jurisprudent” (wilayat al-faqih). "An excellent study of Sistani." 11 February 2006: SCIRI, Daawa and Sadrists in the Certified Iraq Elections Results. SCIRI recoups some influence within the United Iraqi Alliance, but the overall structure of the coalition remains complex and diversified. 20 January 2006: Beyond SCIRI and Abd al-Aziz al-Hakim – the Silent Forces of the United Iraqi Alliance (Iraq elections analysis based on final results). The results within the results show that bedrock support for the UIA is polymorphic and largely unexplored. 22 December 2005: A Disunited Iraqi Alliance Triumphs in the South (elections analysis). The Supreme Council for the Islamic Revolution in Iraq (SCIRI) – often seen as the leading force within the United Iraqi Alliance – is in fact surprisingly marginal in areas south of Baghdad. See also the related discussion at Helena Cobban’s blog, Just World News. 13 December 2005: Towards Sectarian Separatism in Iraq? The 15 December elections may determine whether abstract scenarios of disintegration are transformed into hard political realities. 23 November 2005: Southern Iraq Gears Up for Elections. Voters can choose between Islamism and secularism – with southern regionalism featuring as a complicating factor. 14 October 2005: Basra, the Shi'is and the Iraq Referendum. Weaknesses in the proposed constitution might lead to the break-up of Iraq in a worst-case scenario. But the fault lines are different from what many believe, and the charter itself could be made more robust with additional checks and balances. Comment article published in Asia Times Online (Hong Kong) and Khaleej Times (Dubai). 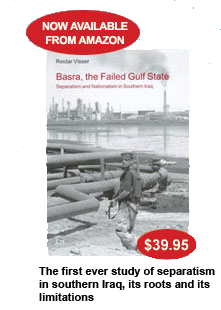 Basra, the Failed Gulf State: Separatism and Nationalism in Southern Iraq (Berlin: LIT Verlag, 2005). The first case-study ever published on an actual occurrence of southern Iraqi separatism. "For anyone seriously interested in the current conflict in Iraq over the question of federalism versus centralism, this meticulously researched study provides a highly instructive historical perspective." "A fascinating account of the birth of Iraqi nationalism … sheds much-needed light on recent debates in Basra about federalism." Shi'i Separatism in Iraq: Internet Reverie or Real Constitutional Challenge? (NUPI Paper no. 686, August 2005). Schismatic Shi'i underground thought on the rise. "A very serious piece of research [which] lays out the details of an important but little-examined political movement in the south [of Iraq]"
Shi'i Perspectives on a Federal Iraq: Territory, Community and Ideology in Conceptions of a New Polity (2004). On the ideological basis for the kaleidoscope of Shi'i positions on federalism. "An effective guide to the different currents among Shi'a political groups in Iraq." — Nicholas Bayne, London School of Economics and Political Science.